distribution Essentially statewide, though of spotty distribution in the mountains and upper Piedmont, and close to the coast. However, it likely occurs in all 100 counties. abundance Fairly common statewide, and locally common (several daily counts over 75 individuals). Not obviously more numerous in one province over another, though the spotty county distribution in the mountains suggests that it may be less numerous there than downstate. flight A long flight season, downstate from late March or early April to mid-October (and sparingly to early November). In the mountains, it flies from late April to early October. habitat A variety of still, open waters, typically lakes and ponds, especially where there are lily pads or other floating vegetation. comments Additional field work in the western third of the state ought to provide new county records. 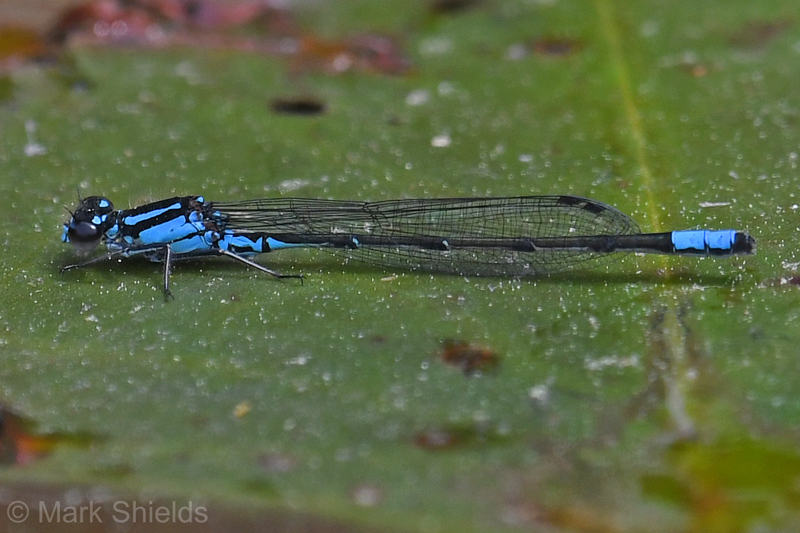 However, there are fewer lakes and ponds in that part of the state that contain water lilies and other floating vegetation, not that this is a requirement to find this bluet. Comment: Scotland, 2018-04-04, Lumber River at the US Hwy. 401 bridge; Wagram Boating Access. - Male. Comment: Alleghany, 2014-07-04, Little Glade Millpond, along Blue Ridge Parkway about 0.5 mi. south of US 21 at Mile Marker 230 - Skimming Bluet Male.